Today I have a bit of an upset stomach so I am not going to the gym but never fear I will be right back at it tomorrow! The last 2 weeks have been some of my most consistent and hard working during this fitness quest. It really helps to have a goal and getting ready for this open water swim is a huge challenge. At least I read yesterday that the water is warmer than usual-70 degrees, oh la la! Currently I am working on the most boring project for work. It involves looking at a spreadsheet with 27,000 items and identifying what branch the item belongs to. Sometimes this requires my looking up the monument or national park to see what area it is in. (On the plus side, I am now somewhat of an expert on the national parks, even obscure ones!). To keep from falling asleep I have a movie on as background noise. 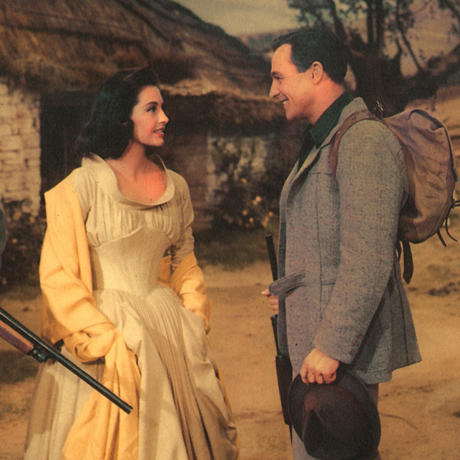 Today I’m watching Brigadoon with Gene Kelly and and Cyd Cherise. Its not the greatest musical but I enjoy it. It has beautiful dancing and a few of the songs are catchy. The thing that shocked me while watching is how insanely skinny Cherise is. In fact, all the women are uber-skinny- made more so by restrictive corsets. It reminds me of the famous scene from Gone with the Wind when Scarlet is upset over not being able to corset her waist at 18 inches after having a baby! Does anyone else think she looks ridiculous with such a tiny waist and large bust? Maybe that seems like the cliched response of a fat girl but honestly! The only thing I can think in her defense is that she was a ballet dancer and they are always very skinny. The sad part is we still set such insane standards. For instance, the other day I was watching Big Bang Theory and Kaley Cuoco’s character Penny is upset when Sheldon guesses that she weighs 120 lbs. Let’s say she is 5 ft 7, 120 would still be well under the body mass index produced by the insurance industry. By all competent medical diagnosis 120 should be considered skinny, even underweight, but on the show she is horrified to be labeled as a fat 120. I even read some articles that listed Kaley as a ‘curvy’ member of Hollywood young. Please! If she is curvy than no wonder so many people are turning to eating disorders. What do we all have to be below 100 lbs to be considered skinny? Crazy! To see the clip go to http://www.youtube.com/watch?v=PJ2pG8fNH9s. They won’t let me embed it. The problem with words like ‘skinny’ is they have no real diagnostic value. They can mean whatever you want and so using such a vague term as a goal for change is dangerous. If skinny is your goal it will literally never be good enough. You will never be skinny enough. I would love to say that the images and skinny messaging promoted by Hollywood doesn’t affect me- that I am strong and know it is garbage. I do see the flaws but I am not invulnerable to the feelings of longing for a body I will never have and an image that will never happen. I don’t know anybody that is perfectly confident all the time and doesn’t on occasion wish for a seemingly better, more attractive body. When those moments come, the images sent out by Hollywood can do damage to my self-esteem and confidence. I am not immune to such feelings. Are you? Luckily, I am wise enough and strong enough to pick myself up and start telling myself the right kind of messages. Perhaps I am thinking of this topic because I have been exercising like a maniac and yet my bi-weekly weigh-in yesterday I had lost no weight. Obviously this was a disappointment but I know that I have become healthier in the last 20 days. My swim times are faster, my weight repetitions and amounts are more, and I feel enthusiastic and happy. The skinniness may not come along but I have to remember that being skinny is a mirage of a goal. Being healthy is real. Finishing my race on the 13th is a real goal, and I know I can do it- skinny or not! What do you think about the illusion of getting skinny? What are your goals for fitness and weight loss and how does the images presented by Hollywood or fashion impact you?